Congratulations to Euan Littlejohns for passing his PhD viva! 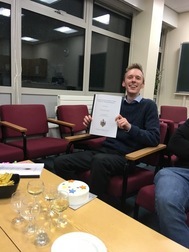 The viva took place yesterday (20 November) and the photo left shows Euan at the post-viva celebration. The external examiner was Dr Rosemary Dyson (Birmingham) and the internal examiner was Matt Turner. The title of Euan‘s thesis is “Continuum elasticity models for tissue growth and mechanotransduction”, and his project has been supervised by Carina Dunlop and co-supervised by Anne Skeldon.